“The movie biz will struggle over the next five years, PwC predicts. U.S. box office revenue will grow at a 1.2% CAGR, increasing from $10.6 billion in 2016 to $11.2 billion in 2021, as exhibitors see intensifying competition for consumer share of wallet.” Source: PwC’s 2017 Global Entertainment and Media Outlook forecast via Variety. Motion Picture Association of America (MPAA) 2016 Theatrical Market Statistics Report, released March, 2017 (PDF). Motion Picture Association of America (MPAA) The Economic Contribution of the Motion Picture & Television Industry to the United States 2017, released February, 2017 (PDF). Box Office Mojo lists 726 films released in the United States in 2017. I’ve recently discovered Stephen Follows’ very fine blog. He is most generous with his insights and analysis. His “48 Trends” series is particularly good. 1. The Motion Picture Association of America (MPAA) released its market statistics for 2012 in March 2013. Global box office receipts reached $34.7 billion in 2012, an increase of 6% over 2011. U.S./Canada box office was up 6% over 2012 to $10.8 billion. This was due to a 6% increase in admissions; domestic ticket prices remained flat in 2012. 3. Movies have been, and continue to be, inextricably tied to novels, short stories (and less frequently to non-fiction books, magazine articles and news stories). These industries are inextricably intertwined. Hollywood is all but bereft of new ideas; authors have them aplenty. 4. This interdependency has, at times, led to film studios purchasing book publishing companies (but not vice-versa). But this has been found to be mainly overkill — you can buy the film rights without buying the whole damn publishing company! 5. While still bottom feeding in the book publishing and short fiction field, the movie industry appears to have found the most successful formula for big bucks: sequels. While movies will clearly remain a primary form of media entertainment for a long time to come, the economics of the industry are in great flux. The movie industry reveals much about publishing in general. Movies are an industry for the masses, and the movie business now operates on a decidedly worldwide basis. Like book publishing, and next month’s magazine, it’s based on “informed” hunches. And, as with these many other publishing businesses, there’s a lot at stake in creating a hit, versus a critically-respected film that doesn’t necessarily bring in the bucks. As you’ll see also in the book publishing section of this site, there are almost 600 new films released in the United States each year, while over 350,000 English-language books are published worldwide. Can we say that the stakes “per title” are higher in the film industry? Of course, but it’s the same game. Regardless, the movie industry is also facing all of the same piracy and “holding the audience” issues that every other publishing industry faces. How they ultimately address these issues will be a lesson to us all. The movie business is more analogous to the book publishing business than most would care to acknowledge. The prevailing wisdom is that both industries are based on “hits” — bestselling books — or films, like Spiderman 1, 2 and 3, that can break box office records in their first weekend. The reality, I believe, is that success in both businesses is based on “backlist” — old titles that sell modestly but steadily year after year. If you’ve got a strong backlist there’s always cash in the bank to pay the front office staff. Syndicate the enormous costs of the hoped-for blockbusters, and the business can thrive. If you live solely by the blockbuster, so shall you perish. I think that both the movie industry and the book publishing industry are slowly learning this lesson. Those who don’t will always find a place at a table at the Bellagio in Las Vegas. I hate to overstate the obvious, but in the creative industries, quality counts. The quality need not be from an obscure English author. But a fine plot, with strong characters, clearly rendered, seems frequently to win the day. People will always enjoy excellent entertainment, in all its media forms. What we’ve learned on the Web is that you don’t have to write The Mayor of Casterbridge in order to draw a readership. The Web has so astoundingly broadened the ways in which people can be informed and entertained. While this is a threat to industries such as the movie industry; it is not their death knell. While this site focuses primarily on publishing in the United States (and to a lesser extent in Canada), the U.S. movie industry is very much an international industry, and domestic box office numbers represent a fraction of its revenue. While the U.S. trade association, the Motion Picture Association of America (MPAA) reports that “domestic box office continued to grow in 2007, reaching $9.63 billion after a 5.4% gain,” it notes also that “worldwide box office reached another all-time high in 2007 with $26.7 billion, a 4.9% increase.” In other words, the U.S. box office revenue represents only 36% of total box office receipts. The chart below from the MPAA shows that while the total number of films released in the U.S. is apparently holding steady around 600, independent studios represent an ever-increasing percentage of the total. 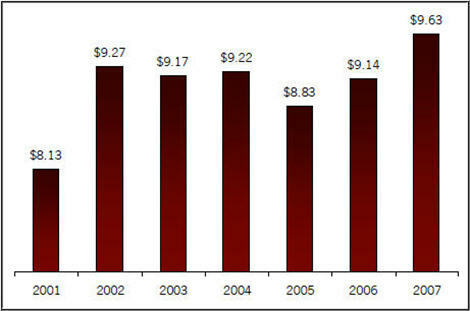 MPAA-released films were at their lowest level since somewhere before 2001. 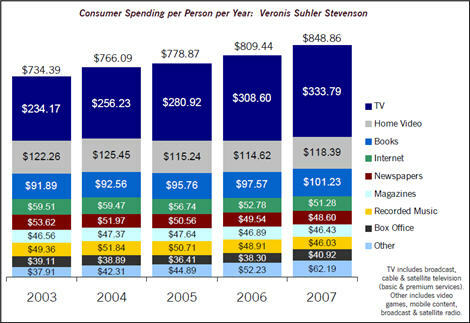 By some accounts it would be shocking to find that even newspapers still command a larger per person per year spend than movies in the theater, and that home video commands nearly three times the revenue of “box office.” The notion of new films being released either directly to DVD, the Internet or television seems decreasingly far-fetched. The implication of the above paragraph is that the MPA, the MPAA’s “international counterpart” is somehow an independent organization; it is in fact the section of the MPAA that represents the American movie industry internationally. 2. Why are Hollywood Movies so Long?